I just received this new-to-me planner from the Van Der Spek Sales group on Facebook and it is perfect for my Franklin Covey compact sized inserts, which you must know by now I am very fond of. The color is Tortora and is challenging to capture in a photo. It definitely has brown in it, but it also has a hint of mauve. It is not overly floppy like the Menthe Touch Me I have if that is a concern you have. It has great flatability without being floppy. 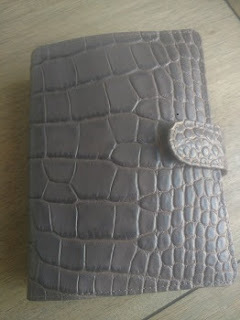 It's a nice planner as most VDS are! Has it got any stiffener? I don't think so. The leather's finish itself requires a tiny bit more thickness, I believe. We miss your posts here in England, Sharon!! 14 months is toooo long!